GT-R goes three for four on the season! 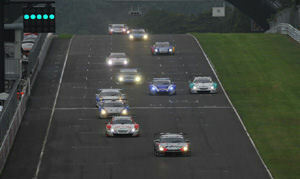 On July 31, the SUGO GT 250km race, Round 4 of the 2011 Autobacs Super GT series was held at Sportsland Sugo in Miyagi Prefecture. In the GT500 class, the S Road MOLA Nissan GT-R driven by Masataka Yanagida and Ronnie Quintarelli ran from pole position to a runaway victory unchallenged by the competition. Just after the start, Ronnie Quintarelli dashed ahead from pole position in the No.46 S Road MOLA GT-R, followed by the No.39 Denso SARD SC430 of Hiroaki Ishiura, the No.24 Advan KONDO GT-R driven by Bjorn Wirdheim and the No.32 Epson HSV-010 of Yuki Nakayama. The only initial change in the grid order came when Andre Lotterer in the No.36 PETRONAS TOM'S SC430 moved in front of 5th-position grid-sitter Takuya Izawa in the No.100 Raybrig HSV-010. 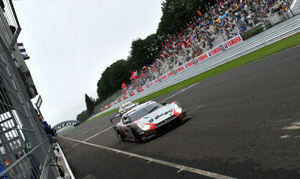 At the end of the first lap, Quintarelli in the No.46 Nissan GT-R already had a 2.4-sec. lead over the rest of the field. Behind him, Ishiura running in second position in the No.39 Lexus SC430 was able to hold off a challenge by Wirdheim in car No.24 by maintaining a faster pace. 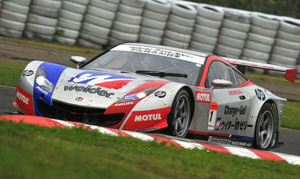 That left Wirdheim behind and facing a challenge in turn from 4th position runner Nakayama in the No.32 Honda HSV-010. Behind them, Lotterer in car No.36 was causing a traffic jam because of his inability to pick up the pace. This created a tight pack competing intensely for 5th position. Running well in the lead at a pace that included setting the fastest lap of the race at 1'17.420 on lap four, Quintarelli was already encountering back markers from the GT300 by the sixth lap. As he worked his way through the back markers, his margin of lead fell to 2 sec. at one point, but by the tenth lap he was running alone in the lead and steadily increasing his margin again. Meanwhile, Ishiura in the No.39 Denso SARD SC430 was unable to close the gap on the No.46 S Road MOLA GT-R. Rather he found himself having to hold off another challenge from the No.24 Nissan GT-R of Wirdheim. On lap 19 an accident occurred in the tightly packed middle group. In a battle between the No.19 WedsSport ADVAN SC430 driven by Tatsuya Kataoka that had worked up from a 14-position grid start and the No.1 Weider HSV-010 of Loic Duval, a breaking mistake by Duval sent his machine off the track. After managing to get back in the race he collided with the No.12 Calsonic IMPUL GT-R on the second corner and spun out. In the aftermath of this, the No.23 Motul Autech GT-R of Benoit Treluyer was passed by Kazuya Oshima in the No.6 ENEOS Sustina SC430, as rapid changes continued in the order. After returning to the pit, the No.1 Weider HSV-010 suffered another collision on the pit road while leaving the pit and eventually had to retire from the race. After the No.100 Raybrig HSV-010 returned to the pit the end of the 24th lap and change drivers from Izawa to Naoki Yamamoto, the other cars began to make their routine pit stops, but among the leaders it wasn't until the 31st lap that the No.39 Denso SARD SC430 running in second place became the first to pull into the pit. As drivers were changed from Ishiura to Takuto Iguchi for the No.39 Denso SARD SC430, the No.32 Epson HSV-010 assummed second position until it made its pit stop at the end of lap 33 and changed drivers from Nakayama to Ryo Michigami. Meanwhile, the No.46 S Road MOLA GT-R delayed its pit stop and continued to run in the lead until finally pulling into the pit at the end of lap 39.